I don't embarrass easily but I can on rare occasion get rather red-faced. Especially, I imagine, if I'd throw a party and no one came. Ergo, I'm asking you to save a date. The time is 7 p.m. The date is Wednesday, Aug. 12. The place is Copperfield's Books, 850 4th St., San Rafael, California. So you can simply appear, or you can reserve a spot on the Copperfield's site — http://www.copperfieldsbooks.com/event/woody-weingarten. I'll be talking about being a caregiver, especially for a patient with a life-threatening disease. Specifically, I'll be focusing on the time 20 years ago when my wife, Nancy Fox, was diagnosed with breast cancer. 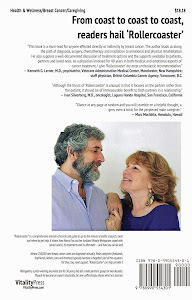 And how we coped — individually and together — during treatments and their aftermath. And how male caregivers (husbands, boyfriends, fathers, sons and brothers) are typically a forgotten part of the equation but need support, too. But, in actuality, my presentation could apply to any of the 35 million U.S. caregivers, female or male. I, Woody Weingarten, who has led the weekly Marin Man to Man support group for two decades, also will be signing my book afterwards. 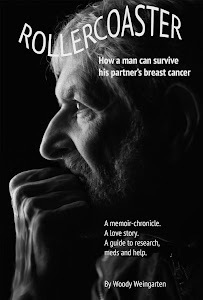 "Rollercoaster: How a man can survive his partner's breast cancer" is unique, a comprehensive memoir-chronicle by an award-winning journalist, a love story and, perhaps more importantly, a guide to research, meds and help. Want to check out what another author thinks of my book? Just click here. Many of you have found that friending me on Facebook or following me on LinkedIn or Twitter is comparatively easy. Showing up takes a bit more effort. But I'd appreciate you taking that road less traveled, which in this case means being there and keeping me from being embarrassed by an empty room. You'd miss learning whether my silver hair is matched by a newfound silver tongue. Save the date and help me save face.